We awoke to another sprinkling of snow this morning. Not enough to be a nuisance, just the right amount if you have to have snow. I think snow is either a love or hate thing. You love it if you are really into the scenery, and hate it if you have to do anything practical, such as clean off your car and drive out of your sloping gravel driveway on it. I am making the best of the season by putting in some quilt stitches on quiet nights and keeping the fire going, in between all of my other chores. Honestly, I'm just as busy in the winter as in the summer and it makes me wonder how in the world I ever manage to get things done the rest of the year? Someone once said to me (in reference to getting things done) that you do what you can, and then leave the rest and don't feel guilty about it. That would never work for me. Why bother to do it at all if you can't do it right? Perhaps I did inherit some of my own mother's perfectionist traits, after all. 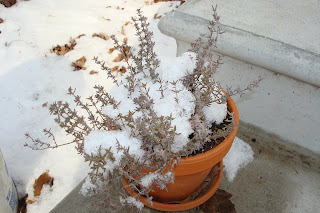 herb pot on the front step- winter thyme! The Mister is earning some extra by helping out on a roofing job this weekend, leaving me to accomplish the usual household tasks and start my seed germination trials. This is where I go through my seed stock, throw out the ones that I know are bad, and try to germinate a few seeds from the rest to see if they are in good shape. Then, I order only what we need. Last year, I skipped that step and didn't know that my pepper seeds were no good. When it was April and there was no sign of life, I had to buy starters for a variety of pepper that were a high-yield handful. By August I was looking for the switch to turn them off. In the Kitchen: This weekend I'll make a pot of corn and crab chowder (a cool weather favorite) which we'll eat with some bread topped with roasted red peppers from last year's harvest. I have so many new baking recipes to try, but my in-laws keep giving us Christmas cookies, so I can't justify baking anything new before finishing those. Another seasonal delight has been boxes of clementines, those delicious little orangey fruits from warmer places. I must eat two a day, on average.Well worth the price. Your snow is beautiful. We only had a dusting of it but it is sticking because of the cold temperatures we are having. Living in Alabama, we are not use to 10 degree temperatures and it is taking a while to adjust but it is suppose to warm back up next week. I love clementines and eat 2-3 a day also. Thanks for sharing and have a nice weekend. Clementine Cuties are a staple around here - SOOOO good and yes, worth the price!! You know when I first popped over here, that first picture looked like a sandy beach ~ can you see that?? Maybe it's one of those optical illusions that looks one way one time and if you stare at it long enough it becomes something else. Your corn crab chowder sounds fab. We've got a pot of chili going and some cornbread. I'm hoping it'll be about 80 tomorrow ~ so far it's 12 but I can hope, right!?? ♥ p.s. - winter thyme...love it! You know, you're right! 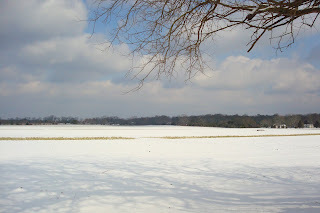 And when that field has nothing green growing in it and the soil is sandy, it looks like a beach even then, without the snow! 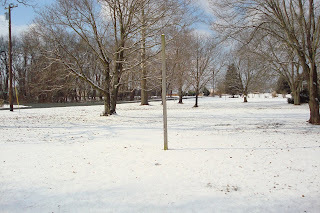 I love snow and I am sure it is because I don't have to get out and about in it unless I chose to. Our driveway is sloped. the other day it took me 3 tries to get up that silly thing! Finally had to back across the street and go like anything, praying I would not slide into the house or the carport post!